It is with sadness that I pass along the news that sweet, little Gregory died during the night of 11/10/08. Gregory had seemed a bit down and was experiencing some urinary issues for which he was being monitored, however his death was not expected. We are doing a necropsy to learn more. Perhaps he was a much older bunny than we believed. While we loved him and did our best to make him happy, our wish for him was to have lived a long full, happy life in a forever home. He had recently been abandoned by the person who had promised to love him forever and perhaps his little heart was broken despite our best efforts. Rest in peace little man---your were very loved by all of us at SaveABunny. I can't believe this has happened, but my human just returned me to SaveABunny after several years. She got married and says she and her new husband just don't have time for me anymore. Anyway, I am still a very cute, loving and sweet boy who is sad to lose my family.I am very eager to find a FOREVER home with people who will always treasure me. I may have some arthritis and whoever adopts me should probably plan to take me in for acupuncture or chiropractic to keep me feeling my best. If you are looking for a delightful , adorable and seasoned middle-aged guy with lots of love to give, please visit me soon! Hello. My name is Gregory. 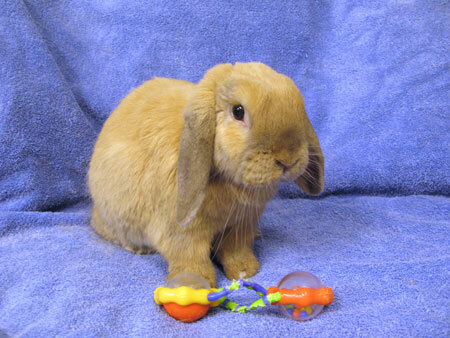 I am a very handsome, friendly neutered Holland lop guy. I have such a delightful, personable way about me. I'm easy going, fun, and of course, very easy on the eyes! Though I'm close, I'm not quite perfect. I have a malocclusion with my front teeth and they had to be pulled. This sounds much worse than it is. I am still able to eat, drink and play, just like any regular bunny! You might have to shred my carrot treats for me, but that's about it. I've been told that I'll be a real catch since I won't be able to chew and dig on furniture and carpet without my front teeth. However, I think I'll talk with some of my bunny friends and maybe they can give me pointers on how to still be a naughty bunny!